Open-source dropbox alternative powered by git. Collaborate on files and tasks without any extra hassle. 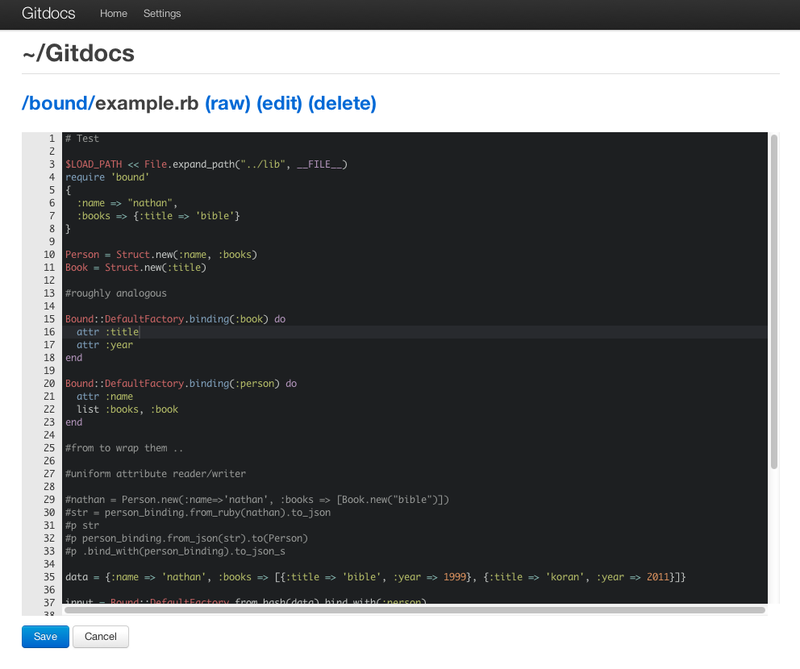 gitdocs will automatically keep everyone’s repos in sync by pushing and pulling changes. This allows any git repo to be used as a collaborative task list, file share, or wiki for a team. Supports a web front-end allowing each repo to be accessed through your browser. Note: Gitdocs has been tested on multiple unix systems including Mac OS X and Ubuntu. Windows support is half-baked but we plan to tackle that shortly in an upcoming release. 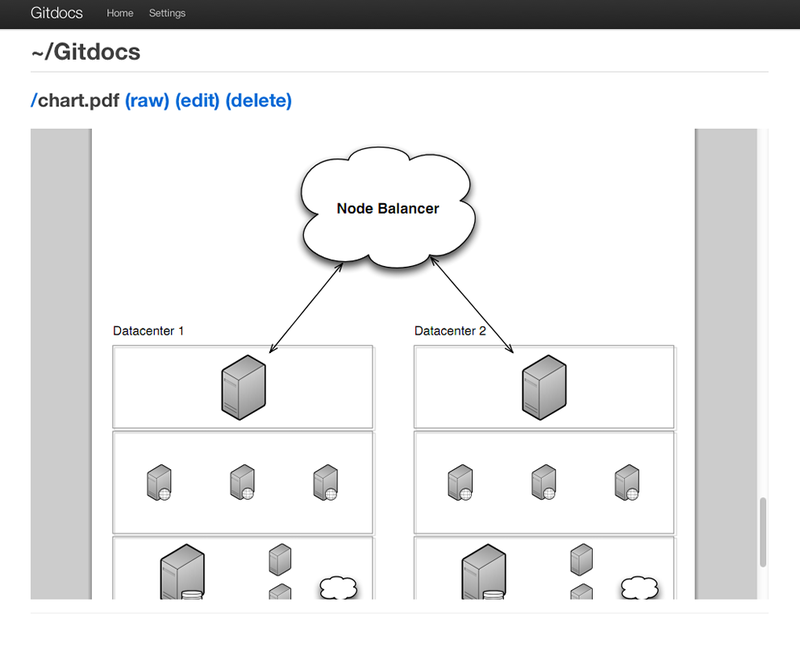 Why use gitdocs for your file and doc sharing needs? Secure - gitdocs leverages git (and existing providers like github) to store your data safely. Versatile - share task lists, code snippets, images, files or just use it as a wiki (with our web front-end). Portable - access your files on any client that can use git. The best part is that getting started using this project is quick and simple. Gitdocs monitors any number of directories for changes and keeps them automatically synced. You can either add existing git directories to be watched or have gitdocs pull down a repository for you. There are plenty of great git hosting providers to safely store your data and you can trust the data is stored securely. If you want a private repo to use with gitdocs, we recommend you check out BitBucket which provides free private git repos after registration. There you go! Now just start adding and editing files within the directory and they will be automatically synchronized across all gitdocs-enabled clients. to enable Growl notification support. 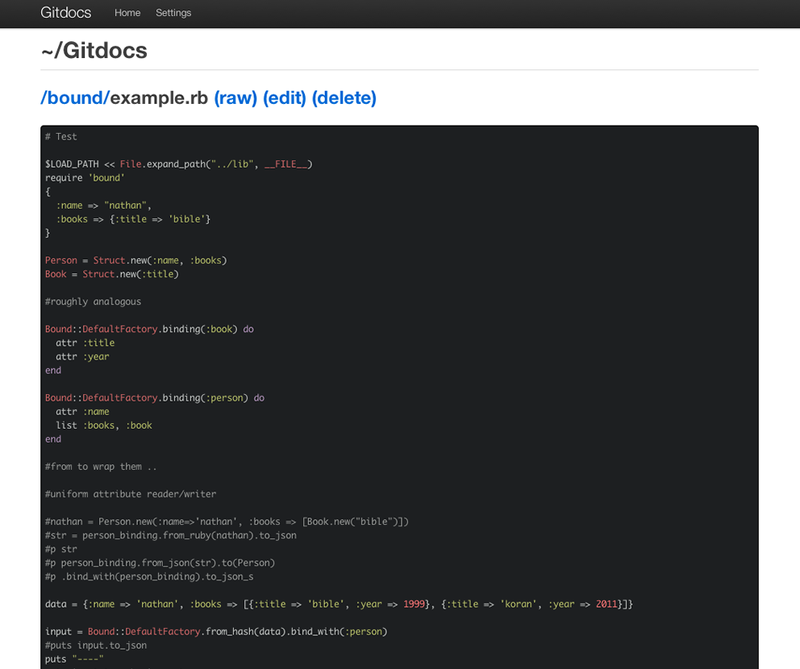 Gitdocs come with a handy web front-end that is available. To check out the front-end, simply visit http://localhost:8888 whenever gitdocs is running. Proper conflict resolution is an important part of any good doc and file collaboration tool. In most cases, git does a good job of handling file merges for you. Still, what about cases where the conflict cannot be resolved automatically? Don’t worry, gitdocs makes handling this simple. In the event of a conflict, all the different versions of a document are stored in the repo tagged with the git sha for each committed version. The members of the repo can then compare all versions and resolve the conflict. At Miso, our team actually uses gitdocs in conjunction with Dropbox. We find Dropbox is ideal for galleries, videos, and large binary files of all sorts. We use gitdocs for storing our actual “docs”: Task lists, wiki pages, planning docs, collaborative designs, notes, guides, code snippets, etc. You will find that the gitdocs browser front-end is well suited for this usage scenario since you can browse formatted wiki pages, view files with smart syntax highlighting, edit files with a rich text editor, search all your files, as well as view individual file revision histories. Click-to-share instant access granting file access to users using a local tunnel or other means. Gitdocs is now primarily being developed by Andrew Sullivan Cant. Gitdocs was created at Miso by Joshua Hull and Nathan Esquenazi. Gitdocs is still a young project with a lot of opportunity for contributions. Patches welcome! SparkleShare is an open source, self-hosted Dropbox alternative written using C# and the Mono Project. More mature but has a lot of dependencies, and lacks some of the features planned in Gitdocs. DVCS-Autosync is a project to create an open source replacement for Dropbox based on distributed version control systems. Very similar project but again we have features planned that are out of scope (local tunnel file sharing, complete web ui for browsing, uploading and editing). Lipsync is another similar project. We haven’t looked at this too closely, but thought we would mention it in this list. If any other open-source dropbox alternatives are available, we would love to hear about them so let us know! Generated on Mon Apr 1 15:05:28 2019 by yard 0.9.16 (ruby-2.5.1).